We were walking on a stretch of White Beach in Boracay one sunny February afternoon when Leo noticed the unusual amount of glare that day. For a while we thought it was just because we slept a little longer than usual and had just gotten out of bed but after an hour the glare was still there. It was only later on that we realized the glare was from the sand  it was so white that you could get blinded on a sunny day unless you wore sun glasses. Boracay’s White Beach, a 4-kilometer stretch of blindingly white sand, is dotted with resorts, restaurants, souvenir shops, spas and bars making it one of the most, if not the most, developed place for tourism in the country. Boracay is also popular for its nightlife and can get really crowded on holidays, weekends and during the dry months of April and May. Along with the relatively high prices for travel to and accommodations on the island, these features do not necessarily endear us to Boracay Island but it’s the sand quality that will be etched in our collective memories for a long time. As already noted, the sand is blindingly white on a sunny day and as fine as talcum powder. Even on a hot day you can enjoy walking barefoot as the sand does not get hot at all. The shallow, crystal clear waters and gently sloping beachfront of White Beach also make the place a beach bummer’s paradise. White Beach is not the only white sand beach around the island. 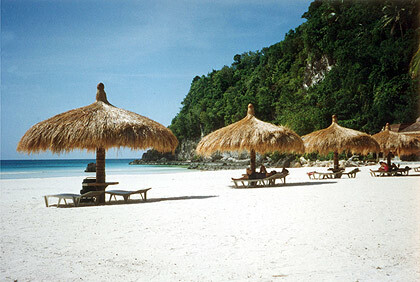 Only seven kilometers long Boracay contains other excellent beaches. 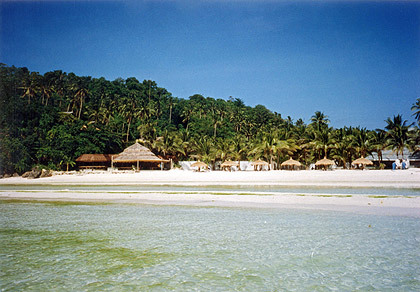 Lined up with White Beach on the western side of the island facing the Aklan mainland are Diniwid, Balinghai, Punta Bunga and Banyugan Beaches. These beaches are protected from the wind and strong waves making them excellent for swimming or just bumming around. Bulabog Beach is the most popular beach on the eastern side of the island and is famous for its constant winds that attract windsurfers from around the world. The other beaches on this side of the island are Lapus-lapus, Ilig-iligan, Manoc-manoc, Lagutan, Tulubhan and Tambisaan. 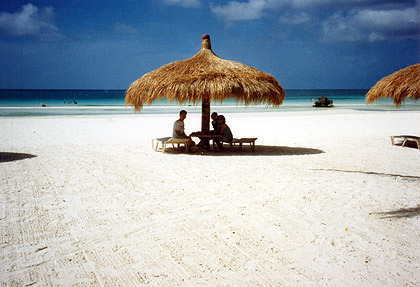 Puka Shell Beach on the northwestern tip of Boracay is famous for the shells that carry its name. 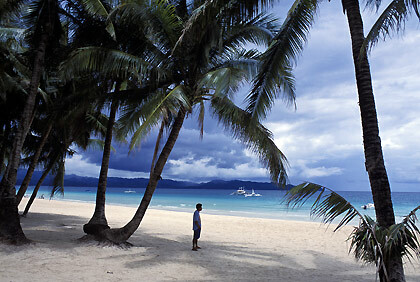 In a fully developed tourist destination like Boracay you won’t run out of things to do. Besides beach combing you can also go on boat tours, snorkeling, scuba diving, cave exploring, kayaking, water skiing, wind surfing, kite boarding and skim boarding among other activities. The night life on the resorts, bars and restaurants along White Beach is legendary. Besides the normal beach combing we ended up touring the northern part of the island, exploring a cave there that empties into the sea and snorkeling at the coral beds on the southern end of White Beach. Boracay used to be another “secret paradise” in the ‘70s until news spread about its beauty and the inevitable tourism boom soon followed. The sleepy little island was transformed into a major tourist destination in international circles, even ending up in a few top ten best beaches lists. Whether this transformation is good or bad is best left to the reader although we normally would prefer a less-developed place with much of its natural beauty intact. (If you want to see how Boracay looked like in the ‘70s, some people say you can simply take a boat ride up north to Carabao Island in Romblon. Or to Calaguas Island off Camarines Norte.) 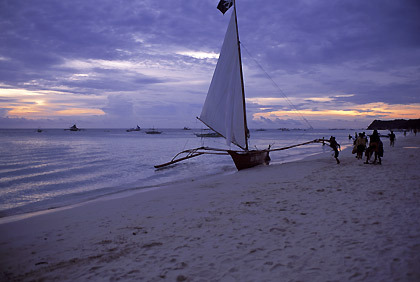 We haven’t visited Boracay in more than a decade but memories of its immaculate sand still linger.